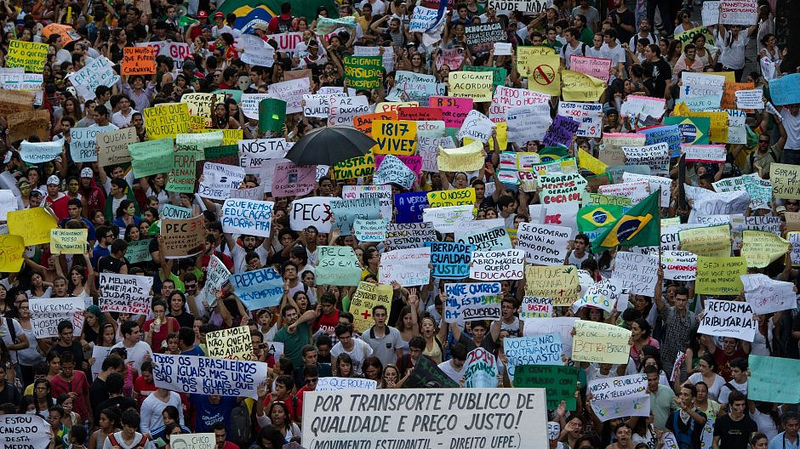 The protests in Brazil began over an issue of a fare increase on public transportation, and grew to encompass demands for better public services and protests over the amount of public money being spent on the World Cup and the Olympics. 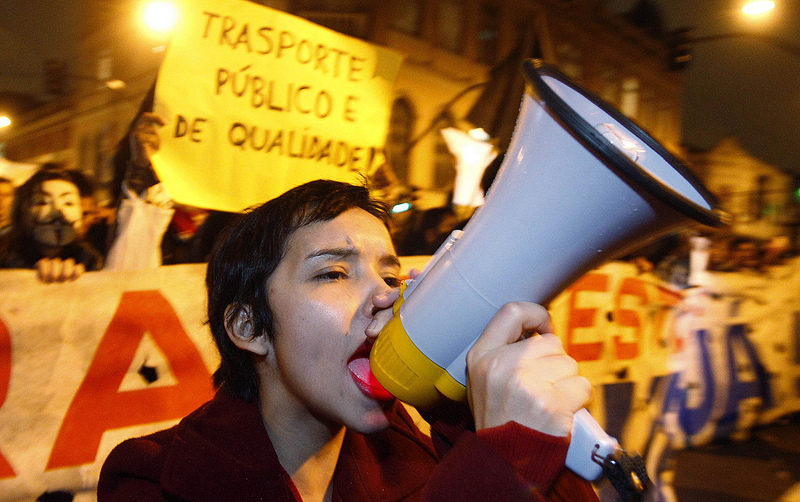 Economist André Lara Resende writes that after the economic and political changes in Brazil over the last decades, the protests cannot be “blamed” on pure economic hardship, inflation, unemployment, lack of democratic representation, authoritarianism, or lack of freedom of expression, as they might have been in the past or in other countries. He suggests that the reduction of absolute poverty in the population has increased the demand for quality services, and that social media allows people to see how many others feel as they do, and to assemble before government leaders get the memo. According to Resende, the issue of mobility in large cities is paradigmatic of the exhaustion of the production-consumption model, where the automobile industry is the pinnacle of industrial development and the car is the supreme symbol of consumer aspiration. The transit hell of the large cities, which only gets worse the more successful development projects are in Brazil, is the ultimate expression of the complete impossibility to proceed without a thorough review of objectives. So what are the institutions that will review, define, and enforce these objectives? Apparently, they are still in their infancy, and Brazilian architects and urbanists are trying to make them grow up. The Brazilian Institute of Architects (IAB) issued an agenda for public discussion on June 29, 2013, in solidarity with the protestors. It responds to three of the issues raised “in the street”. The IAB insists that transportation, land use, and housing are inseparable urban functions that require permanent public policies, and argues that improvisation and discretion are not compatible with the level of development achieved by the country. What’s striking about these statements is what they reveal about the lack of coordinated planning and the frustration of the professionals working within that context. The first issue on the agenda is “Mobility and Planning.” Here, the IAB’s highest priority issues are public transportation for home-work trips, multimodal networks, and improving pedestrian public space and bike paths. The IAB’s proposals are 1) to implement permanent systems of urban and metropolitan planning, to be treated as a function of the state, 2) to create a fund for the support of transportation studies, and 3) to make public investment in transportation conform to the Urban and Metropolitan Transportation Plans and the National Policy on Urban Mobility (PNMU). The second issue the IAB addresses is “Mobility and Housing.” The IAB is concerned about the physical extent of urban agglomerations and its effect on transportation and quality of life, and believes that housing development needs to focus on urban infill, densification and upgrading of favelas and peripheral settlements. (Unfortunately, the federal government’s current massive housing finance plan, Minha Casa, Minha Vida (MCMV) seems to encourage cookie cutter, urban-sprawl type development.) The IAB supports offering housing construction loans directly to families, thereby cutting out the construction companies that are producing housing under MCMV. The IAB proposes 1) the creation of a national goal to bring services to favelas and peripheral settlements, 2) the creation of a construction loan program that would offer loans directly to families, and 3) providing technical assistance to improve the home or eliminate geotechnical, environmental, or construction risks. The third issue is “Transparency in Public Projects.” The IAB is convinced that one reason for high cost overruns on public projects is the fact that the designer only designs a “basic project,” while full construction documents are produced by the contractor who has won the project. The contractor details, prices, and builds the project, which encourages adjustments, overpricing, and corruption. Architects and urbanists in Brazil are taking hold of the energy and momentum released by the protests and using it to make a stand for sound urban planning policies and the strong institutions required to enforce them. Hopefully, they will achieve critical mass and Brazil will benefit from the kind of long-term urban planning policies it hasn’t had in the past. Many thanks to Julia Michaels and her blog RioReal.com for links to interesting articles and news of events during the protests. Thank you! Here is a recent post by former city councilwoman Sonia Rabello which shows that the mayor dragged his feet on the housing issue. http://www.soniarabello.com.br/habitacao-para-o-porto-do-rio-tico-e-teco-no-planejamento-governamental/ I hope to track the progess the IAB makes on all of this, in my blog. Not easy to keep up, these days! Not easy, no, but you’re doing a great service, thanks! Here in India, we can take a page out of Brazil’s experiences. We are seeing a similar rise in awareness among urban populations; however, cash-strapped inefficient local governments, even with good intentions, are unable to address these needs. And then there is the huge issue of corruption, which far from being pushed under the carpet, is a thriving creature we need to tackle! Reblogged this on The River Revista. I was at a small seminar discussion with the direction of housing of the Federal Ministry of Cities a while back. When we asked why Minha Casa Minha Vida seemed to be making the very same mistakes of huge public housing ventures in Brazilian history (as well as other countries) she sighed and then jumped into a very frank response admitting that the housing program was by no means ideal but it was at such a huge unprecedented scale: over 1 million units constructed within a year and another million on the way. She admitted that MCMV was perhaps more of a jobs-plan meant to quickly boost the economy and provide large amounts of housing all over the country than it was about social housing. She justified the mass housing approach by saying the only way her department could get so much money was to fit it into the existing PAC ideology–big projects, big money, big results; and that a more local or individual approach advocated by the IAB (which I think could produce housing bubbles and/or mass default like we saw in the US with federal backed mortgages) would only produce a fraction of the units they are building now. They chose quantity over quality and are hoping for better followup and maintenance this time around. I think they are also hoping that the economy will continue to grow and boost the economic power of the lower middle class; and perhaps that will prevent a the “favelafication” of past housing projects. Rose Compans has an excellent overview and critique of “Minha Casa, Minha Vida: o revival do BNH?” published in Rio de Janeiro: Um Território em Mutação; published this year. It’s a bit dry, but covers the situation from a Rio perspective quite comprehensively.